We have 2 new patterns at the printer. They will be sent out to the distributors later this week. The first one pictured, Mother's Garden was done in honor of Barb's mother, Leona Adams. Her initials are under the tree branch. The other initials are her children, grandchildren and great grandchildren. Love this one as a mother's day gift! Both patterns include an alphabet so you can personalize your sampler.These should be in your local shops in a couple of weeks. I'm busy today working on my latest quilt. Will show some pictures soon. Wow!! I just said to myself..."BBD strikes again!!" Gorgeous! Both are so sweet!! You always come up with the best patterns -- both cross stitch and quilting! There are both must haves! I love Mother's Garden! So pretty, both of them! Congrats on the new designs. STUPENDI,VERAMENTE UNO SPETTACOLO DA VEDERE E DA CREARE. 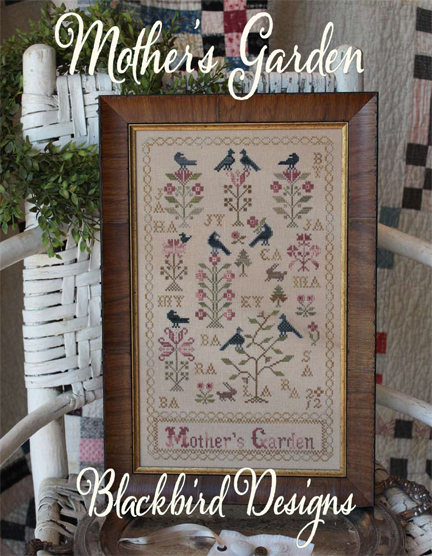 I love the Mother's Garden, what a sweet design. Both are sweet...I really like the flowers, though. Thanks for keeping us all way behind on our stitching. I'm trying to finish Wild Garden. Love them both, just beautiful. Really a lovely design !!! they are both so beautiful! 29?! humm how old is that son of yours??? Love your patterns. I finished the "Birds of a feather" quilt and rename mine as "Birding." I had it showing at the Mid-Atlantic Festival in Hampton, VA. I had a lot a fun and I suspect more people will be buying the book by the comments I received. Just wanted to share with you. Thank you. Such a lovely and gorgeous designs.! I love the garden. Congratulations to a job well done. I could take some pictures here and print suing EPSON Ultra Premium Luster Photo Paper for its high quality of paper that can reliable. Thank you so much for being a part of "For the Gatos" with Theresa. I am happy to say that I own many of your designs and your generosity makes me glad to be a BBD customer. Mother's day is definitely coming. 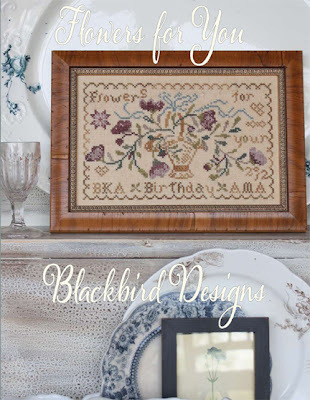 I think the designs here are great gift ideas.I particularly like the blackbird design. Thanks for such a great idea.My mom will absolutely be thrilled. Missing you - will we be seeing your fabulous lovlies at Market? Love your patterns and your stitching is gorgeous! Is it still possible to get a pattern of yours called Beneath the Sunlit Sky? I have looked a couple of places but have not been able to find it. I looked on your site but did not see it either. Thanks for you time. I love your blog and your designs are awesome. Hope tou will post again real soon, with the quilt market scoop! First of all I have to say that I'm a huge fan of Blackbird Designs. I have stitched a lot of the designs and more are waiting. I hope you see this comment because I need some help with locating some Madeira fabric. I'm finishing a little box and I don't have enough of the fern blue with cream background.I think the number is 2605-15. I just need a 5 inch square. I have looked online and called a few places, but no luck. I'm hoping you know of a shop that might still have some of this fabric. You've done it again! Smashing!!!! Nice information, many thanks to the author. It is incomprehensible to me now, but in general, the usefulness and significance is overwhelming. Thanks again and good luck!!! I don't know what to say except that I have enjoyed reading. Nice blog. I will keep visiting this blog very often.